Ford CEO Allan Mulally really impressed the crowd and reporters after his CES Keynote about Ford in vehicle connectivity and navigation innovations including systems to merge cellular connectivity with vehicle systems, a customizable dashboard, and a humanized communication interace called “Eva” which will allow the driver to request features and “talk” to the car. Mulally was even more impressive after his talk when he answered questions from the tech crowd about Ford’s plans. His enthusiasm or Ford and for technology in cars came through loud and clear. I had a chance to ask him if he thought all this innovation would require money from the government as part of the auto industry bailout. 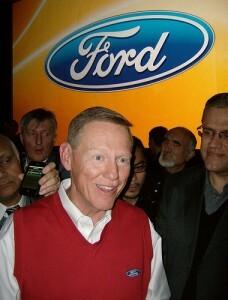 Ford is the only one of the three key US manufacturers that has not asked for money, and Mulally indicated they did not have plans to do so based on his assessments of the quality of Ford vehicles and how their new models are gaining acceptance even in Europe, especially Germany where Ford remains a popular brand name. Although I wouldn’t bet on Ford not asking for a piece of the bailout pie eventually it is great to see a charismatic and technologically sophisticated fellow in charge of one of American’s most complex and valuable industries. If Mullaly can’t pull Ford’s feet out of the fire, nobody can. This entry was posted in Car Tech, CES09, companies, computers, conferences and tagged alan mulally, CES09, ford, ford ceo, vehicle navigation by Joe Hunkins. Bookmark the permalink.